I love a good pamper evening with a face mask and a peel off one gives my skin that refreshing feeling. I do sometimes struggle with these masks as my skin can get sensitive when peeling them off but these are great at unclogging pores. Todays post features some I have loves and some not so much. 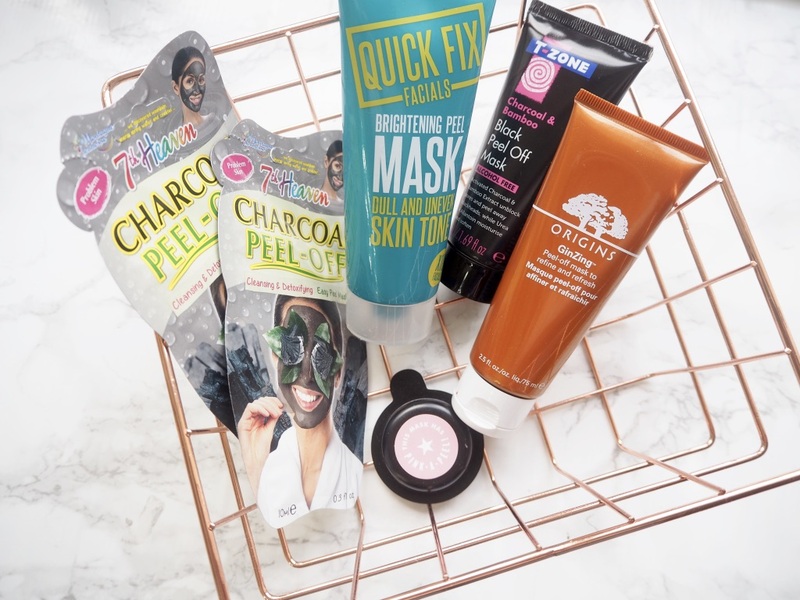 If you are new to try out faces masks then 7th Heaven is the best brand to try them out with as you get one sachet for one use and they don't cost a fortune. This new one is a peel off mask with charcoal to help draw out impurities and excess oils from the skin. As I said I can find these painful to remove but this one doesn't irritate me at all and peels away nicely. This is one of those peel off masks that isn't just for unclogging the skin and instead helps brighten the complexion. This contains a number of ingredients including papaya extract to promote cell turnover, mulberry extract to bright the skin tone and goji berry extract to help boost radiance. This whole new range by T-Zone has been taking the beauty world by storm and got it perfectly right with the charcoal trend. This mask helps draw out those impurities thanks to the charcoal and unclog any blackheads I may have. I have found this to be quite painful to peel off so I focus on my nose and chin where my skin gets clogged up. This was one of the very first peel off masks I tried and definitely one of the more funny ones when wearing it, with its neon orange shimmering colour making you look like a real life oompah loompah. This is from the GinZing family so it helps boost the radiance of the skin by buffing away dead skin cells. I have to say this has quite a strong alcohol like smell and can feel a little intense on my skin so i'd be careful if you are sensitive. I'm so happy S&G have started selling a range of masks like this and they are pretty good too. This funky pink colour mask dries to a thick layer that is easy to peel away and doesn't hurt but draws out all the dirt from the skin. It contains clay powders to absorb oils, vitamin C to brighten the skin and camomile to keep the skin soothed. What are your favourite peel off masks?